From Sea to Shining Sea? Four congregations have requested to join our Conference in time to be considered for membership at assembly this fall. This has been – and is – a season where many communities are looking for new alignments related to changes across the Anabaptist landscape. We’ve been in conversation with a dozen different communities stretched from Queens (NY) to San Francisco (CA). For me, it’s been a challenging wave to ride for the first months of my work as executive minister. It’s been both an invigorating and exhausting time. While I believe the Spirit is at work in this time of tumultuousness, it’s hard to know exactly where it’s all going. This is adaptive change and paradigm change. This kind of growth wasn’t in any strategic planning. Though change sometimes comes upon us and we find ourselves testing what the Spirit is doing in the midst of it all. Finding our hearts “strangely warmed” as the disciples did on the Emmaus Road with the resurrected Jesus. As we approach assembly this fall, we will be inviting delegates to affirm four new congregations as members in our Conference. These four congregations have some familiarity with us already and their leaders have already established relationships with other leaders in our Conference. These churches (one in Queens, New York and three in the Los Angeles, California area) will add to our urban and multi-ethnic realities. These congregations will continue to enrich and challenge our life together as Franconia Conference into the future. I’m hoping that we’ll find ways to embrace all that means as we seek to share God’s amazing grace and peace together. The three California congregations seek to be admitted as a group together. This enables us to provide better accompaniment and assistance along with them. All three had been previous members of Pacific Southwest Mennonite Conference until earlier this year when the conference reorganized and these three congregations sought a new affiliation. 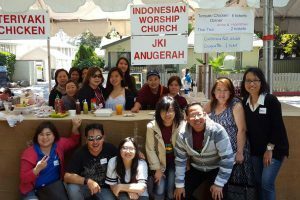 The three churches –Jemaat Kristen Indonesia Anugerah (JKI or Grace Indonesian Christian Congregation) in Sierra Madre, Indonesian Worship Church in San Gabriel, and International Christian Community Fellowship in San Bernardino – have strong and long-term Anabaptist commitments. Each congregation worships in a mix of Indonesian and English. These congregations have strong ties to our Philadelphia Indonesian speaking congregations as Nations Worship Center and Philadelphia Praise Center have found a sense of home and family within our Conference. 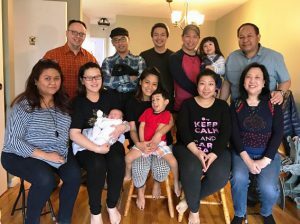 Leaders of our Philadelphia Indonesian-speaking congregations have shared their experiences with their West Coast colleagues which has made the California congregations wonder if they too might find family with us in Franconia Conference. For many within the Indonesian community, the idea of relationships that span the continent seems easy to maintain; it’s only half as far away as Indonesia. In our age of ready communication technologies and easy bi-coastal travel, I believe that we can effectively, though differently, accompany and partner with these congregations. We’ve estimated a cost of about $10,000 in annual expenses to begin this partnership with the California congregations, which would include some staffing support and the hiring of an additional stipend leadership minister to work specifically with these congregations. We’d intend to review this within three years together. In the past, we have worked at church planting in Hawaii. We have maintained long term partnerships with congregations in Mexico City. For 50 years we have traveled the six-hour trip back and forth to our congregations in Vermont. This will have some similar characteristics; there will for sure be challenges, but I believe that we’ll learn and be stronger by cultivating these partnerships together. Each of these congregations brings vibrant gifts of leadership and service. They’ve been invited to share their resources with us as we seek to multiply our gifts together for the sake of the God’s Kingdom on earth. The fourth congregation, Bethany New York – a congregation in Queens – has been in a dating relationship with our Conference for over a year. The congregation’s founding pastor has moved toward retirement and the emerging pastoral leader, Hendy Stevan, is currently a full-time student at Eastern Mennonite Seminary (EMS). Though planted in affiliation with the Church of God, the church identifies with Anabaptism and has completed a teaching period on the seven core convictions of Mennonite World Conference. Though this would be our first congregation in New York City, we’ve had previous conference member congregations in Long Island that were planted out of mid-20th century initiatives, connecting with alternative service for conscientious objectors. With Hendy’s ongoing studies at EMS and ongoing strengthening of relationships with other Pennsylvania congregations, along with the broader Mennonite Church USA body at Convention, Bethany is ready to become a full conference member and to participate in our life together. These four churches total a membership of approximately 400 people and would add approximately 12 possible additional delegates to our discernment body. Each church has been invited to consider sharing 3-10% of their annual income with the Conference. We commit, then, to walking together, to giving and receiving counsel and to extending the right fellowship which we have maintained for hundreds of years in our Conference community. These new member congregations will continue to re-shape our Conference community. Each is seeking the broader relationships that are accessible through membership in Mennonite Church USA and our connections with Mennonite World Conference. I believe that this is God’s invitation for us to continue to be transformed and to continue to live together in seeking justice, with a great love of mercy and a willingness to walk humbly toward God’s dream. Congregational Profiles for each of these churches mentioned will be coming out in the weeks leading to assembly. In addition, look for stories from our Philadelphia Indonesian communities regarding their connections to the California congregations. Delegates will have a time to discuss and discern affirming these congregations for membership at our annual Assembly Scattered Meetings. If you are a delegate please be sure to register and attend one of those. Also, please feel free to contact me anytime for more conversation as we move toward this time of further discernment together.